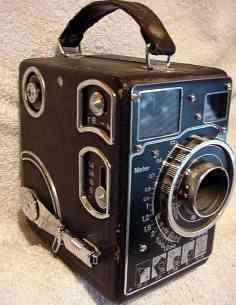 Produced in 1933, this movie camera is equipped with a lens Bush Glaukar Anastigmatic 1:2,8/20mm. It is a 16mm, with a cartridge Siemens. 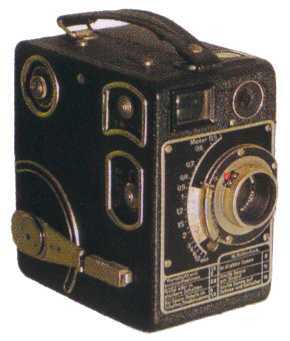 In 1938 a variant was produced, wich weight was kg. 1800. My camera weights kg. 1,450 and the measures are the following: 70x123x125mm. The body is metal, covered by black leather.My camera works perfectly. It is compact, a little heavy. 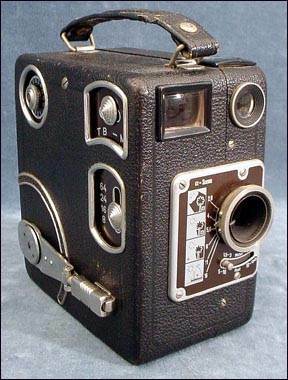 Produced in 1934, this movie camera is equipped with a lens Meyer Gorlitz Siemax 1:1,5/20mm. It is a 16mm, with a cartridge Siemens. The camera weights kg. 1,780 and the measures are the following: 76x123x125mm. Il corpo è in metallo ricoperto di pelle di colore nero. The body is metal, covered by black leather. My camera works perfectly. It is compact, a little heavy. Produced in 1938, this movie camera is equipped with a lens Rodenstock Heligon 1:1,5/20mm. It is a 16mm, with a cartridge Siemens. The camera weights kg. 1,780 and the measures are the following: 85x125x130mm. Il corpo è in metallo ricoperto di pelle di colore nero. The body is metal, covered by black leather. My camera works perfectly. It is compact, a little heavy. Produced in 1939, this movie camera is equipped with a lens Rodenstock Sironar 1:2/10mm. It is a 8mm, with a cartridge Siemens. The camera weights kg. 750 and the measures are the following: 50x125x95mm. Il corpo è in metallo ricoperto di pelle di colore nero. The body is metal, covered by black leather. My camera works perfectly. It is very compact, light and handy.